What kind of profit can I make betting? What return on investment (ROI) can I expect to make? How do I know it really is possible to gamble successfully? Which tipsters should I follow to enjoy success? These are all questions that I’m sure many of you have asked yourself at one time or another when considering betting for profit. first-hand about their betting experiences, showing you just exactly how they make their money? Especially a punter that made 342% betting bank growth last year alone? The practicalities of punting for profits. By typing “Best Investments 2016” into a search engine, it would appear that we should be overjoyed at the prospect of getting a rate of return of 8 to 12% from any investment. Yet, last year, an SBC member and semi-professional gambler made 342% profit and still thought he could have done better! Yes, that’s 3.42 X his initial starting investment in one year…You are reading that right! What’s more, via SBC’s Latest Practical Punter Report (as published last week) he showed members exactly how he did it and the exact tipsters he followed and strategies he used for his success. Allowing you the chance to copy him exactly or simply use his report as inspiration to help you beat the bookie! Last week’s release was just the latest in a series of special Practical Punter Reports we have published, which are geared to show you exactly how other punters are making money. We could tell you all about the theory that goes into making such a great profit and we’re sure you would learn a lot about successful betting if we did. But we don’t want to stop there. We feel that being a Smart Betting Club member should mean that you can see all the theory being put into practice in the real betting world…and that is exactly what our Practical Punter series does. We all know that betting brings its own ups and downs. How many times have you heard that old cliché, that gambling is one long “rollercoaster ride”? And you know what? The reason clichés become clichés is generally because they happen to be true. Betting really does involve periods of prolific profit making which are frequently followed by sharp drawdowns, and a failure to deal with the unique mental challenges this brings is the most common reason for people failing at what is a great way to invest money. That’s just one more reason why we feel the Practical Punter Reports are so useful to our members. Written by long-term profitable gamblers, they highlight and describe the realities behind the theory. They illustrate the mistakes that are so easy to make and the strategies that really do work to make you money. What’s more, they help you to identify with someone who has been making money from following tipsters for years – and that will help you enormously when it is necessary to ride out the bad times and making your punting pay. Soon, you will be scornfully looking at the ads boasting a potential return of 12% per annum, and thinking much bigger. The idea behind each Practical Punter Report is to provide both inspiration and encouragement to those trying to achieve the same goal – making money through tipsters. Access to the Practical Punter Reports is supplied to all Gold or Platinum Smart Betting Club members. You can sign-up today and gain instant access to the full Smart Betting Club service and let us show you how to make money betting, both in theory and practice! Follow These 16 Tipsters Free With Us! It’s a little known ‘Secret’ that as a member of the ‘Smart Betting Club’ you can follow all kinds of top performing tipsters via our members only tipping forum. It really is a great way of getting started making money from your betting as you can follow all of these forum based tipsters every day for free as part of your SBC membership. This also now includes a number of tipsters that usually charge a fee for their expertise – yet who have agreed to post on our forum. Starting from Monday, we welcomed top racing tipster Oddsbeatertips onto the SBC Forum, they have agreed a deal with us to post ALL of their bets for the next 3 months. This is quite the coup considering their outstanding record as since they began in 2014, they have made a 24.46% ROI and 1078 pts profit from 4407 bets. Selecting anywhere between 5 and 10 racing tips per day, they advise bets usually 1 hour before racing starts at approximately midday and utilise a fair odds policy on the prices they settle. We expect interest in this service to be very high indeed, which is why we are so pleased to have them onboard! Chris was the runner-up in our Horse Racing Britain’s Got Tipsters contest from 2015 and since that ended in September, he has continued to post all of his bets to great success. Settling all bets at Betfair SP, his record reads as follows since June 2015: 256 bets, 61.5 points profit and at a tremendous 24.02% ROI. Those of you with access to early prices can also often obtain much better prices than the Betfair SP he settles to. As well as posting all his tips each day on the SBC Forum, Chris also sends them out via email to SBC members keen to have them delivered directly. 3. All 12 Britain’s Got Tipsters Football Contestants! Earlier in December we kick-started our new Britain’s Got Tipsters contest, which this time is devoted to football betting and features 12 top experts all posting their tips on the SBC Forum. The goal for each tipster is to prove their expertise and win a contract with us to supply tips next season and beyond to SBC members. The contest started in December 2015 and will run until the end of May 2016, so there is plenty of time for you to start following the best experts! Another top tipster now posting all of their bets to SBC members is the golf expert – Pinpoint Betting who impressed mightily in private proofing to us during 2015 with a 21.90% ROI from 929 bets. Since December he has been posting all his golf bets on the SBC Forum and with the golfing season back in full swing, they are well worth following! Featuring a mixture of outright win and each way bets as well as a few Top 10/20 tips, Liam, the brains behind the Pinpoint Betting service really knows his stuff. Some people don’t like betting on favourites, but when they come from a tipster with a profitable record in excess of 20% ROI, its hard to ignore and that is the case here. Paceman is an SBC member who since May has been posting his easy to follow favourite tips and built up a considerable profit of 35.84 points (21.33% ROI) from 168 bets. His is certainly a thread to keep an eye on as he has demonstrated a clear edge at the front end of the market. All of the tipsters mentioned above are now available to follow each day as part of a Smart Betting Club subscription. This provides you with access to our members-only forum where you can pick up each tip as they are posted.So, if you are looking to get started betting with tipsters and don’t want to splash the cash on expensive subscriptions, why not consider following some of these free tipsters as part of your Smart Betting Club membership. Can you obtain the results a tipster claims? In today’s modern betting world, one of the key points you need to consider before following any tipster is exactly how their advised odds stand up. Or to put it in more simple terms – Can you obtain the results a tipster claims? After all, if a tipster puts up a horse at 10pm the night before racing and quotes a price of 6/1 from a bookmaker such as Stan James or Boylesports – the chances of actually getting your bet on at 6/1 are very slim indeed. Not only are those two bookies amongst the very worst for slashing a price based on even a whiff of shrewd money, but in general it can be hard to get much down on a popular tip the night before racing. Ultimately, this might mean you have to take 9/2 or 5/1, rather than the 6/1 advised. Repeat this enough times and any edge that a tipster might have can easily disappear. Especially if the tipster settles the bet at 6/1. All of this is why, in the latest Tipster Profit Report, we introduced for the first time our ‘Adjusted Profits’ Tipster Tables, where we are illustrating the actual genuine profits tipsters have made AFTER a minimum of 15 minutes have elapsed from the time of bet advice. For every tipster review we undertake at the Smart Betting Club, we now employ a member of our team to track the odds availability of the tips they advise. To take a recent example – In December’s SBC Magazine (Issue 95) we reviewed a racing tipster for whom we tracked the odds available on the tips advised from a panel of 6 bookmakers (William Hill, Paddy Power, Coral, Bet365, Betfair Sportsbook and Ladbrokes) after 15 minutes and 1 hour had elapsed. We then compared the results if taking a price after 15 minutes or 1 hour to the advised odds and Betfair SP to showcase how this changed the results claimed. In total, our odds tracking took in 556 bets over a 5-month period to ensure we had the largest amount of data possible. The good news with this tipster is that you could actually IMPROVE profits by taking a price 15 minutes after a tip was advised. The claimed 18.6% ROI during this period would have increased to 19.6%. Were you to wait an hour, there was a noted drop in the ROI down to 14.9%, whilst most encouragingly, at Betfair SP this tipster still made a 12.1% ROI. The clear evidence from this tracking was that this tipster is claiming fairly achievable odds and is one to follow. 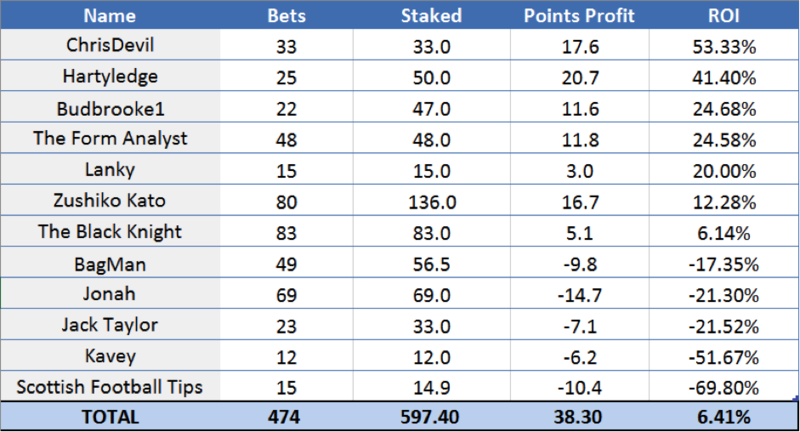 As we perform similar odds tracking for each tipster we review these days, we compiled all of this data for each tipster and presented it in our new Adjusted Profits Tables to present the differences on show. This helps to raise awareness of those tipsters with both fair and possibly, unfair practices when it comes to settling bets and most crucially of all – how you can obtain the odds they quote! Allow me to illustrate further using two examples from the Adjusted Profits Table, which are based on the annualised profits made to a £2,000 betting bank. This £2,000 betting bank figure is merely a simple comparative sum – you don’t need this to follow them, it just helps us to compare and contrast easily. In the example featuring Tipster 1 below, our tracking revealed that you could actually boost the claimed profits by as much as 5% within the first 15 minutes of their advising a bet. This is down to an extremely fair policy whereby Tipster 1 quotes and settle all tips to a very achievable price. Simply by using a site like Oddschecker to compare the best odds you can often beat their results. To the £2,000 bank comparison sum, this 5% ROI difference in your favour over a year would be as much as £718 – a very considerable sum indeed. On the other side, there are also those tipsters who quote what can be considered unrealistic odds as this next example proves. If taking Tipster 2’s claimed results, you would have a £4,788 profit – however with this service we noted major changes in price with a 6% ROI drop within the first 15 minutes. This claimed £4,788 profit quickly became £2,207 after a drop of over £2,500! These are two of the more extreme examples, although it’s fair to say Tipster 2 has a lot to do to improve the fairness of the odds they quote. Until they make changes to how they quote odds, then they will not reach the SBC Hall of Fame or be a tipster service we recommend. On the flipside, Tipster 1 deserves great credit for settling bets at very obtainable odds. Therefore, before you consider joining a tipster, stop to consider just how available or easy their claimed profits are to obtain. Simply listing the profit and loss sums is no longer enough in today’s modern betting and bookmaking world. You need to know if you can match the advised prices…because it can ultimately decree whether you make a profit or loss from their advice! The good news is that there are many tipsters out there, including those in our Hall of Fame who operate fair odds availability policies. Ensuring that at worst, you can match their claimed results and at times – even improve on them by using odds comparison websites. You can find the full ‘Adjusted Profits’ Table in the latest Tipster Profit Report and all SBC reviews include such odds tracking as standard these days. It’s part of our quest to genuinely help you make money betting with tipsters. 2 days into the New Year and if you are anything like me, chances are you have already taken yourself off to the gym to try and burn off some of those excess mince pies. January is always a bumper month for gym owners, but the sad reality is that most people signing-up to get fit will never stick it out and give up within the first few weeks, out of pocket and out of breath climbing the stairs! One of the best ways to stick at a fitness regime is to sign-up with a Personal Trainer, somebody who has the expertise and motivation to get you fit (and who you don’t want to let down). And this is where the parallel with betting comes in, because if your New Year’s Resolution involves making more money punting, you can really benefit from an expert betting ‘Personal Trainer’….Someone to help get you Bet-Fit! The easiest step to make money betting in 2016 is to hook up with one of the genuine, free tipsters that we track here at SBC. Take for example the profitable record below from 3 different free racing tipsters who each have been operating for several years. Their results are outstandingly profitable, whichever way you look at it and they offer a great solution to get started in 2016. You can read detailed analysis on all 3 (and several other free tipsters) as a Smart Betting Club member. Whilst there are some good free tipsters out there – there are far more paid-for tipsters, many of whom will return you far more in profits than cost in subscription fees. Some people dislike the idea of paying for tips, yet if they are going to make you outstanding profits over and above what they cost, why wouldn’t you stump up? Take for example, one of the most popular racing tipster services in our Hall of Fame and their record below. Once again, it’s another immensely profitable service, both over the past 12 months and longer-term. Perhaps best of all are the Return on Capital growth figures, which stand at a whopping 267% over the past 12 months and 915% long-term. This guy’s tips are making serious profits. The cost to you for following his advice? As little as £33 per month and just over a £1 a day for his quality tips. Just as you wouldn’t expect to run a marathon the first time you step on a treadmill, so it’s the same with betting as you can be just as effective by making incremental gains to achieve a big goal. Forget about placing £200 bets, instead try simple £10 or £20 stakes, which won’t break the bank and will help make you a clear profit. Just look at what staking both £10 or £20 per point on each bet with the tipster highlighted in point 2 would have made you in the past 12 months: £3337.00 or £6,674.00. Even when taking into account the monthly cost of following his tips of £33 per month, the £3,337 or £6,674 profit from the past 12 months easily dwarfs this and shows why it’s worth paying for tips from the right sources. As a Smart Betting Club member, you can also follow a series of free tipsters that post exclusively on our forum. You can simply login to the site and follow their tips every day. Our most popular free tipster would have to be the racing expert Chris Patti based on his outstanding record of 65.23 pts profit at 27.76% ROI from 235 bets. Best of all, this record is based on Betfair SP, so perfect for those of you limited by bookmakers. As an SBC member, you can follow Chris both via the forum and through a special email sent out every day to SBC members only. Not too far behind Chris in the popularity stakes would have to be ‘Paceman’ with his ‘Short but Sweet’ racing tips, which also continue to impress. Focusing in on short priced racing tips, he is sitting on a 23.5% ROI profit with a 49% strike-rate from his long-running forum thread. Other top tipsters posting on the forum, include the profitable Premier League tipster, Jason Mills & busy racing expert The Form Analyst, alongside all 12 of the contestants in our ongoing Britain’s Got Tipsters Football contest. My final tip is more of a practical one but it’s one I personally swear by to help you maximise your betting profits. Just as a good Personal Trainer will often act as your fitness sounding-board to keep you on track, so I firmly recommend having a ‘betting mate’ to do the same. By this, I mean somebody trusted such as a good friend, relative or even partner who you are accountable to for your betting. If you know you have to run all your major betting decisions by somebody you trust and who has your best interests at heart, it will stop you making rash (and often incorrect) decisions. Not only this but they can also help keep you motivated in tough times. I have my own ‘betting mate’ with whom we each honestly discuss our own punting and the key decisions we both make. Just the simple act of having another pair of eyes or somebody outside your betting bubble can at times be invaluable, even for the most experienced gambler! Of course, one of the best ways to make any new year’s resolution a success is in having proven experts to guide you along the way. Here at the Smart Betting Club, we have over 10 years experience of helping people make money betting and have plenty to help you make 2016 your best punting year yet. So if looking for a betting ‘Personal Trainer’ why not give us a try as with our risk-free money back guarantee you have nothing to lose and everything to gain. After all, we might not be able to make you fitter, but we know a thing or two about making money betting!